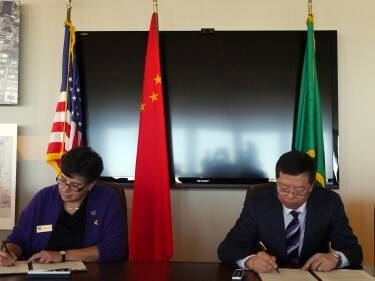 The state of Washington and the Chinese province of Sichuan, with the help of leading research universities, have pledged to prioritize clean energy and plans and designs that will encourage the development of climate-smart, low-carbon cities. A memorandum of understanding, called the “2+2 MOU,” was signed Tuesday between the state and province as well as the University of Washington and Tsinghua University to catalyze the science, technology and investment needed to grow innovations that will underpin adaptable and resilient urbanization. Gov. Jay Inslee and Wang Dongming, party secretary from Sichuan province, signed the agreement in Seattle during Chinese President Xi Jinping’s visit this week. “Following the model of the landmark climate agreement signed by President Obama and President Xi, it’s incumbent upon centers of innovation like University of Washington and Tsinghua University, in cooperation with the state of Washington and province of Sichuan, to build the solutions that will address one of the most pressing existential challenges of our time,” said Gov. Inslee. The memorandum of understanding pairs experts from the UW’s Clean Energy Institute, Climate Impacts Group, Urban@UW and several groups focusing on intelligent transportation with counterparts at Tsinghua University who work on similar research. These experts met for a planning conference earlier this month and also participated in several video conferences this summer to hammer out details of the agreement. The ultimate goal is to lay a roadmap for Washington and Sichuan province to prioritize research that can complement investments being made in each state, in order to accelerate the science, engineering, planning and forecasting capabilities in both jurisdictions as they work toward creating more low-carbon cities. Leaders from the two states and two universities, referred to in the agreement’s “2+2” name, will meet regularly over video conference calls and plan to have projects laid out by March for how to reach their goals. “Leading research universities, such as the University of Washington and Tsinghua University, have a vital role in helping develop not just the technologies, but the policies and public awareness needed to create a more sustainable future,” said UW Interim President Ana Mari Cauce. “This partnership aims to tackle global challenges, in particular energy issues and environmental problems confronting human beings. It will also be part of a wider effort to integrate university-led initiatives to the government and society as a whole,” said Tsinghua University President Qiu Yong. This memorandum of understanding follows last year’s U.S.-China Joint Agreement on Climate Change and Clean Energy Cooperation, signed by President Obama and President Xi, which cites climate-smart, low-carbon cities as a focal point for investment among both nations. The UW and Tsinghua University also recently partnered to create the Global Innovation Exchange (GIX), which will pioneer new models of global teaching and learning. This new agreement will create a master’s degree through GIX in clean energy. 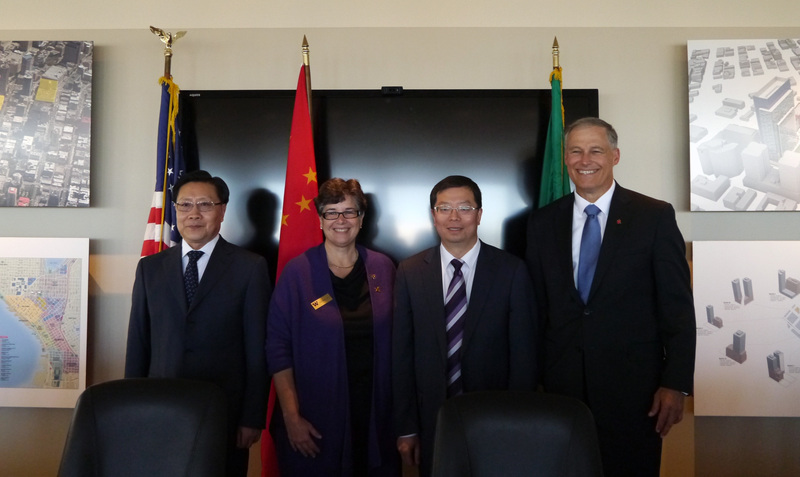 Washington and Sichuan are aptly paired to collaborate on clean-energy solutions, said Daniel Schwartz, director of the UW’s Clean Energy Institute and a chemical engineering professor. The province leads China’s clean energy production and has plans to significantly grow in the areas of solar, hydropower and wind. Similar to Washington, which sends clean electricity up and down the West Coast, Sichuan province will grow its smart grid and set up an innovation center to help design new power systems for transmitting clean energy to China’s eastern urban areas. For more information, contact Schwartz at dts@uw.edu or call the Clean Energy Institute at 206-685-6833.